Senior forward Kelli Prange stands at the top of the key and looks for a teammate during a women’s basketball game against Rhode Island Wednesday. 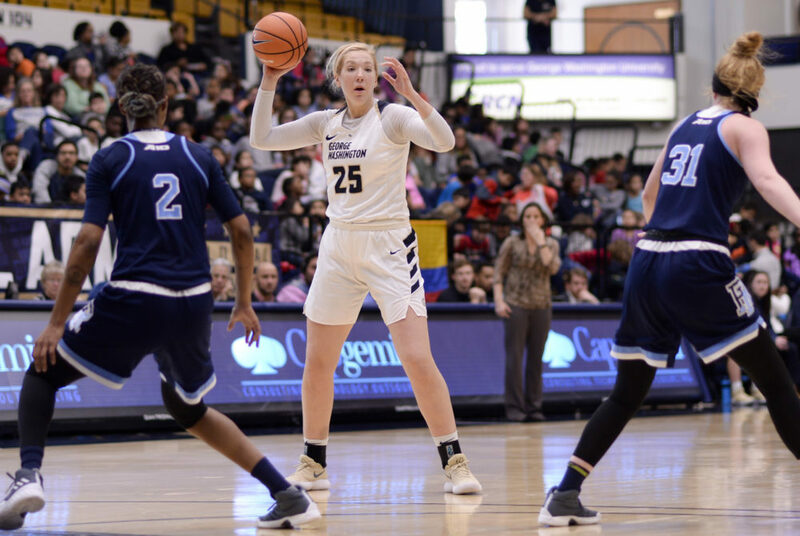 With 36 points on 14-of-17 shooting and a career high 13 rebounds, women’s basketball senior forward Kelli Prange put on one of the program’s all-time best performances against Rhode Island Wednesday. Her tallies came after sitting on the bench for a combined 13 minutes and recently returning from a concussion that forced her to miss seven games. Prange’s scoring load – which was the highest individual scoring total the team has seen in more than 20 years and tied for fifth most in program history – led GW to a 65–52 victory over the Rams (3-18, 1-7 A-10) on an otherwise slow-shooting morning and a below average defensive night from the Colonials (9-10, 4-3 A-10). 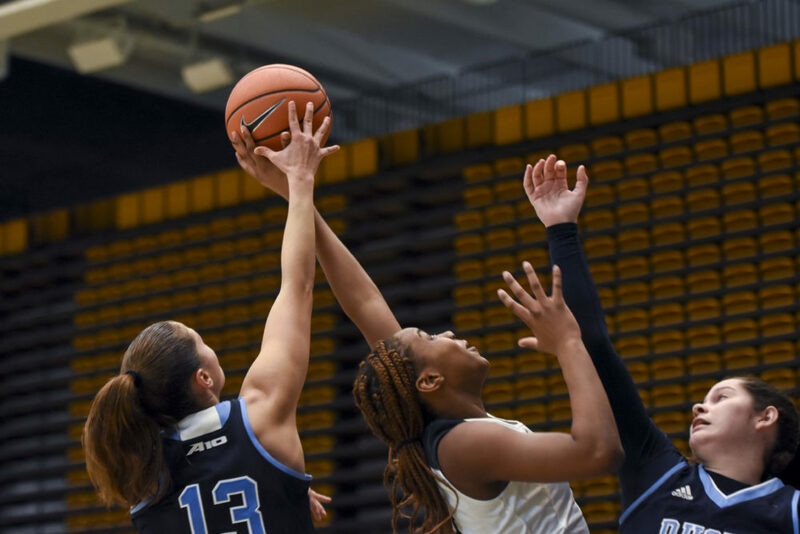 The victory – which is GW’s first of a three-game homestand – kept the Colonials in seventh place of the Atlantic 10 and cemented Rhode Island’s position in last place. Aside from Prange and senior guard Brianna Cummings, no Colonial player made more than one basket from the field. As a team, GW shot 34.3 percent and went just 4-for-20 from behind the three-point line. The matchup was GW’s annual Field Trip Day, where school children from the District, Virginia and Maryland come to the Smith Center with free admission. Cummings said the kids give the Colonials a home-court advantage all game long. Cummings finished the day with 14 points and three assists in 35 minutes of action. Freshman forward Chyna Latimer goes up for a layup in the game against Rhode Island Wednesday. The Rams capitalized on a loose Colonials defense early in the first quarter, opening the game with a 7-0 run. GW overcame the deficit with five unanswered baskets including a three-pointer from junior forward Kelsi Mahoney. The Colonials gained momentum after battling back from the early deficit, finishing out on a 17-2 run in the final 6:63 of the first quarter. Rhode Island battled back in the second quarter, catching the Colonials defense flat-footed on a 7-3 run midway through the quarter. The Rams outscored the Colonials 18-12 to cut the lead to two at the halfway point of the game. Entering the second half, Rizzotti said they focused on tightening up the defensive play and preventing Rhode Island from taking advantage of the team’s lack of balanced scoring. “We talked a lot about that at halftime, saying ‘we gotta make some shots but our lives will be easier if we focus on the defensive end and get out in transition and get some easier shots around the basket,’” Rizzotti said. The third quarter saw the most complete performance by the Colonials, where they outscored the Rams 22-11. Junior guard Mei-Lyn Bautista opened the quarter with a three-pointer to power a 7-2 run. Bautista led the team with four steals, aiding the Colonials’ strong transition play in the second half. Cummings said the Colonials were able to overcome their first half struggles and finish out the game strong by playing smart. The Colonials return to action Saturday against Saint Louis at noon in the Smith Center.